Which tape product is best for your needs? 1. Is tape the best solution for your problem? What characteristics should it have? If you are securing something temporarily, like a cable to the floor, then you may not want the most aggressive adhesive available.Gaffers tape is the best product for this application, because it is strong enough to give you lots of holding power, yet the adhesive is not so strong that it is going to damage the surface it is attached to. Duct tape works fine for this purpose, but has a more aggressive adhesive which may, in some cases, damage the surface it is attached to when it is removed. If you are trying to make a permanent repair or attachment, then you should consider the most aggressive adhesive available, even though it may leave adhesive residue or damage the surface it is attached to. If you don’t plan on removing the tape, then this should not be a concern. Duct tape is great for making repairs, as it is durable, waterproof, conforms to the surface it is being used on and is really sticky. A duct tape repair will last for a long long time. 2. How long do i want this attachment to last? If your use of tape is for something very termporary, like a label, then a product with a non-aggressive adhesive may meet your needs. these products are usually less expensive, but they do not stand up in environments where they will be exposed to water, sun light, or any caustic substances. If your need is for something more permanent, then you will want to consider a tape with some sort of fabric reinforcement. Gaffers tape is true cotton cloth and derives its strength from a tight weave of cotton fibers. Duct tape is a vinyl tape with fiber reinforcing, but is not true cloth. both will give a stronger bond than either paper or vinyl-only tapes. 3. How important is cost to my final decision? 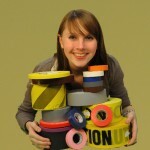 Many of our customers are surprised at the cost when they first consider whether to use duct tape or gaffers tape. It may be hard to understand the value aspect of a decision to use a product that seems almost identical to something but costs twice as much. It takes only a moment of handling the two products to understand the cost difference. Gaffers tape is made of true cotton cloth, a woven product which gains great strength and more consistent handling characteristics from this true cloth base. It tears straight, no matter how short the piece, doesn’t stretch like duct tape, and most important, doesn’t reflect light. The non-relective nature of gaffers tape may be its best characteristic, as this allows you to make invisible repairs, ones that don’t show up even in the bright lights of television and film work. It is also available in many colors, again giving it an advantage in making an invisible repair or in matching your carpet. If a non-reflective finish is desirable, but the cost of gaffers tape is prohibitive, give grip tape a try. It has a matte finish like gaffers tape, but is priced closer to regular duct tape-the best of both products! 4. Do i need to concern myself with what is left behind when, or if, the tape is removed? One of the characteristics which gives gaffers tape an advantage over the competition is the quality of its adhesive. While almost any tape will leave a residue if left in place long enough in a very hot or humid environment, gaffers tape is much less likely to leave behind problems that have to be cleaned up later.